StudioPress Themes - Generate Pro Review | Grow Your Subscriber List! What exactly is a theme? A theme functions as a template for your website, and is responsible for many aspects of its design. It will also determine the layout and look and feel of your site so you’ll want to take your time and choose wisely. WordPress offers a massive library of both free and paid themes. I like StudioPress themes because they’re built on the Genesis Framework, which offers tons of design and customization options. 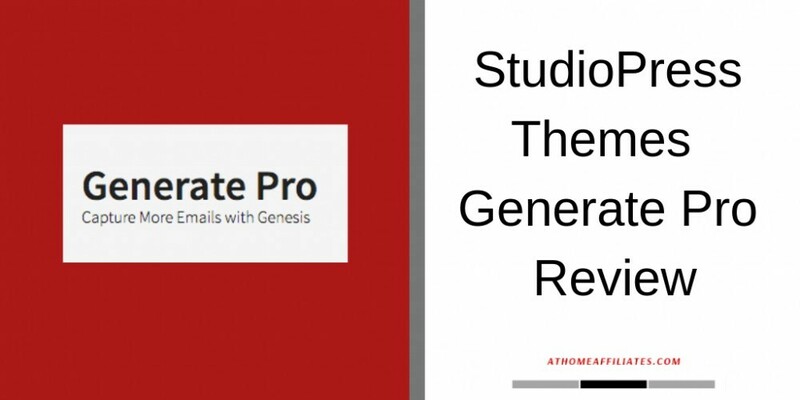 In this post, I’ll be reviewing the Generate Pro theme from StudioPress. Let’s get started. Themes from StudioPress look professional, are SEO friendly, and since they’re mobile responsive, they’ll look great on any type of device. The themes provide both form and function, and you don’t need any coding skills to design a great looking and easy-to-navigate website. All themes are lightweight, yet powerful, and the state-of-the art designs are intuitive to customize. The flexible coding offered by StudioPress ensures your site will be compatible with all web changes that occur in the future. Each theme is compatible across all browsers, and the Genesis Framework enables super quick page-loading times. StudioPress themes offer top-notch security thanks to the Genesis Framework with unlimited updates and support. The theme options and mix-and-match layouts provide vast customization and design capabilities. Read my post: “The Best WordPress Themes By StudioPress” here. StudioPress themes are built on the Genesis Framework so you can’t have one without the other. Think of Genesis kind of like a super theme that enables a StudioPress child theme to be layered on top of it. When purchasing a theme from StudioPress, rather than working with a single theme, you’ll be working with two components, the framework and a child’s theme. The framework is responsible for the function of your site, whereas, a child’s theme handles the design. Working with a child’s theme allows you all the functionality and design capability of a parent theme, without having to worry about your customizations being changed with future theme updates or altering the original code. This is why all StudioPress themes are child themes, and will prevent you untold headaches going forward. Genesis serves as a parent theme to the child’s theme, and is the foundation of your website responsible for storing all updates within its files. The child’s theme is the skin that lies on top of this foundation and controls stylization. 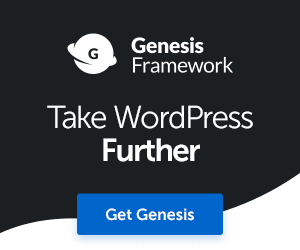 You only need to buy Genesis once at an affordable fee of $59.95, guaranteeing you lifetime access to the framework, along with all upcoming updates and customer support. You can learn more about the Genesis Framework here. Read my review of the Genesis Framework here. Now that we’ve covered the features of StudioPress and Genesis, I want to highlight the reasons why Generate Pro is one of my favorite themes. With Generate Pro you can use theme options and custom page templates to get your site up and running within minutes. Templates include a Landing Page, Blog, Archives, and Default. The theme customizer lets you play around with settings that control color and other stylization options, and you can preview all changes in real time. Editing is much easier when you can view your edits as you make them. Customize your homepage with widgets that reflect your brand, and your header with your own logo. Like all themes from StudioPress, Generate Pro is mobile-responsive, performing well on smartphones, desktops, and tablets, and will look amazing no matter what browser you’re using. Functionality options include, color styles, custom backgrounds and menus, featured images, footer widgets, and threaded comments. Where Generator Pro truly shines is providing web design that helps you grow your email list. Email marketing is imperative if you want to build a loyal subscriber list to increase conversions and sales, the ultimate goal of any website. Learn more about Generate Pro here. What Is The Secret Weapon Of The Generate Pro Theme? Generate Pro’s secret weapon lies in its list-building capabilities. While email marketing tends to take a backseat with all the buzz around social media marketing, it’s still the best way to deliver your most recent content to your readers’ in boxes. Within this content, you can invite them to take action, whether that’s checking out a new product you’re selling or a service you want feedback on. A call-to-action on your posts is a highly effective way to initiate action on the part of your readers. No other form of marketing does it better. This is because an email is quite personal, unlike social media, and everybody uses email. Maybe the most important aspect of email marketing is the ability to build trust with your followers and potential followers through the art of persuasion. This is significant because people don’t patron those they don’t trust. 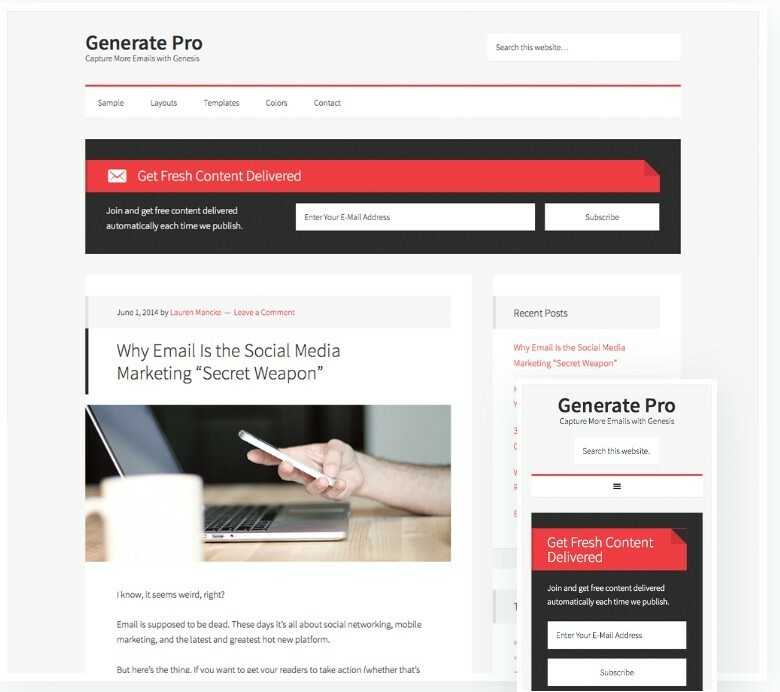 Generate Pro’s template will help you build your list and a loyal subscriber base, the main purpose behind its design. This theme isn’t just for marketers, though, it’s for anyone looking to expand their database of email addresses, making consistent communication possible. For instance, let’s says you’re in a parenting group, and you want to keep all members current with what’s going on in the group. An email list comes in mighty handy for this purpose. It also applies to political activists, sport enthusiasts, charitable organizations, or environmentalists. Building an email list is applicable for all types of organizations, and of course, is incredible for sharing your weekly content, and marketing your amazing products and services. 1. A prominent opt-in box: With this box front and center on your site, readers won’t miss the opportunity to subscribe. Although this box is impossible to miss, it’s not annoying so won’t take away from the reader’s experience. I like that the opt-in is stationary rather than a distracting pop-up. While your homepage is an obvious location to place an opt-in, placing one on every post as well, will give your readers additional opportunities to subscribe. Generate Pro conveniently places a subscriber box in the upper right-hand corner of each post on your website. How Much Is Generate Pro? 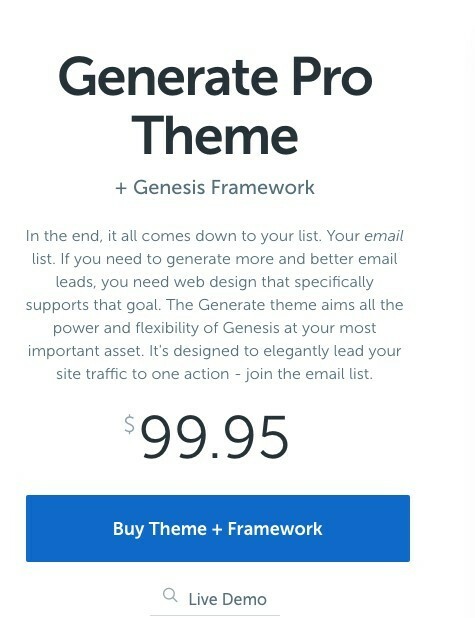 Generate Pro will cost you a one-time fee of $99.95, which includes the Genesis Framework and a StudioPress child’s theme. You’ll also get unlimited updates and website support, along with access to detailed tutorials. Try the live demo out, before you buy, to get a feel for how the theme works. The Genesis Framework and all StudioPress themes only need to be purchased once, and can be used on as many sites as you want. After that, any other themes you buy will be discounted. Following your purchase, the framework and child’s theme will appear in your StudioPress dashboard. Simply press the blue button to download the zip file, and upload it to your WordPress dashboard. Activate the theme and you’re ready to start customizing. It’s as simple as that. You can buy Generate Pro here. If you’re looking for managed WordPress hosting, consider WP Engine. It’s easy to set up and the hosting is lightning fast. 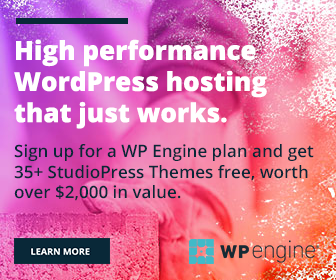 If you sign up for a plan with WP Engine, you’ll get over 35 StudioPress themes for free, along with the Genesis Framework. This is a steal considering the value is over $2,000. Or sign up for the Pro Plus All-Theme Package to receive unlimited access to every theme in the StudioPress library, along with all updates and theme support. If you’re an affiliate marketer or have an eCommerce site, consider using Generate Pro. It’s a great theme for list building, and its minimalistic design makes for an exceptional user experience. If you’re interested in how I got started online, read my review: “Is Wealthy Affiliate Legit Or A Scam” here. Generate Pro is a StudioPress theme built on the Genesis Framework. 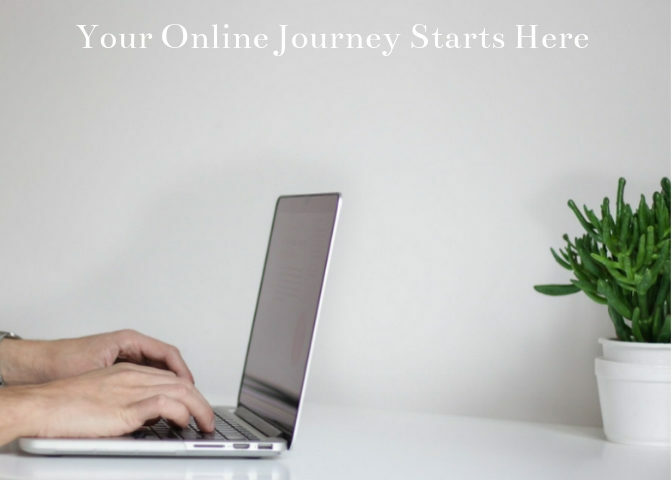 It’s got a ton of extraordinary features, and will support you in growing a loyal subscriber base, whether you’re an online marketer, a blogger who wants to send out weekly content and updates, or someone who operates an eCommerce site, and wants to keep their followers in the know. You can’t go wrong with themes from StudioPress. Download Generate Pro here. Please leave a comment below if you’d like to share your personal experience with themes from StudioPress.